The Journey of Blue Wing! I started my part of this blog on Sept 28th, made a few entries, then scrapped and restarted on Dec 3rd. There simply hasn’t been any time to sit and write entries. Here goes again. I think the easiest start is a quick recap of key dates. In 2002 I met met my partner, Duwan, and heard for the first time that she was interested in living on a sailboat. In 2007 we started taking sailing lessons, completing enough courses to do a couple of week-long sailing charters. This year we decided to rent out the house and buy a sloop. We did some boat shopping online and drove to the Florida East Coast for a whirlwind boat shopping tour starting October 6th. Now we own a Catalina 36′. We have sold most of our stuff and quit our jobs.The renters have moved into our house, where we are still doing some work on the exterior. 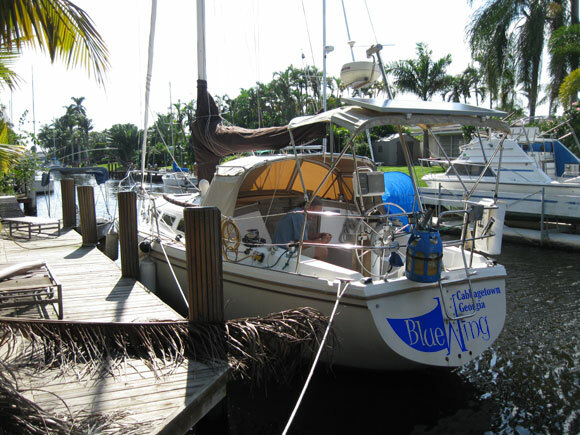 One of our kind friends is allowing us to stay at her house until January, when we head to Ft Lauderdale to get the boat ready for a cruise to the Bahamas. ‘First, I feel the need to establish some common ground. You and I are most fortunate. Here’s why. The universe is unbelievably vast, cold, and empty. Think of the space you occupy. Odds are two or three bazillion-to-one that this space should be a vacuum. Odds are a gazillion-to-one that the space should be occupied by some kind of matter: you know, star, rock or cloud nebula. Yet here we are. Not only are we matter, but we are alive. And we’re not bacteria We’re not varmints. We are self-aware human beings, capable of savoring and manipulating our environments. Damn. We don’t have much time. Better get to it. So greetings from our ‘port’ of call: Cabbagetown, Atlanta, Georgia, USA. This entry was posted in Life on the Water. Bookmark the permalink. Y’all are doing what most of us only dare dream of. My hat’s off to ya! Thanks Greg! And thanks for being our first commenter! Didn’t know your are so philosophical. You are missed. Don’t forget your DB2, you never know. Will keep reading. Safe sailing. Happy New Year. Hope all is well. “Got outta town on a boat for a southern island…. Sailin’ to reach the far, far away seas.” You and Duwan are awesome! I guess it’s rude to invite oneself, but if you ever port into Florida Bay in the Keys, I’d love to come visit the Blue Wing. Gotta Martin for my birthday a year ago, would love to jam with you guys. Take care. Safe voyage. Big adventures! Absolutely! We will be posting our intended destinations. We’d love to see you and yours, and hang out. Congrats on the Martin. Hi Matt. Hope you are keeping everyone straight. I thought I would be reaching for my phone or checking IM all the time, but it hasn’t even occurred to me. Been staying busy though. Happy New Year! Thank God for heathens. Rave on!! Glad to hear all is going well. You didn’t include a picture of the bilge and the engine! We will all live vicariously through your adventures so have some good ones! Duwan should try ginger in tea, cooking or candied for sea sickness; also those pressure pads you wear on your wrist. Might work for her. It’s great that you had the guts to just go follow your boating dreams. When we were in Upstate NY, my wife and I took the U.S. Coast Guard Auxiliary, U.S. Power Squadron boat class and got certified when we bought our Rinker180. We’d cruised the Hudson River, from Albany to West Point and had a 350 acre lake a mile from the house. Cruising the Bahamas on a sail boat… OMG !!! !… You two are so luck to be able to follow your dreams. I’ll be watching your blog. You both rock! Well perhaps that is not the right thing to say for someone on a boat.. How ’bout…you float! I love your philosophy on life…Enjoy every minute. Enjoy the ocean breeze, the sunshine, the rain drops, the ding of the mast, the stars in the dark sky…… Maybe one day I will have guts enough to follow my dreams 🙂 Hummmm..Maybe I should take the time to figure out what my dreams are… OOPS too late… the next emergency deadline is here… Can’t dream now… Doesn’t that make you love your decision even more??? Sail on!